Squash House Quilts: They told me this would happen…. I sat down at my trusty Bernina 630E last evening to sew another Christmas Cottage Block that I had cut out the previous evening. When I turned on the power switch I got a terrible whining noise - like the sound of an old car horn - I tell you it was really awful! I sewed on it all weekend and had no problems whatsoever! This machine isn’t even a year old. Before completely panicking, I decided to see if there was something I could fix. I have an uncanny ability to fix darn near anything mechanical - some sort of genetic throw-back on my Lithuanian side. I removed the throat plate, made sure it was clean (of course I knew it was, I take very good care to clean it after every project), removed the bobbin and hook and cleaned and oiled that area, checked that the power cords were fully plugged in, rethreaded the machine and turned it back on again. WAAAAAAAA she screamed at me again! OK - one more try - re-check everything and turn it on a 3rd and final time. Same gol darn noise! Thank goodness I have two back-up Bernina’s - a 153QE and a 185E. So I got out the 153 and proceeded to remove the 630 from the Koala. As I grasped the handle to pick it up, I noticed that the bobbin winder was engaged - DUH! Smack upside the head! 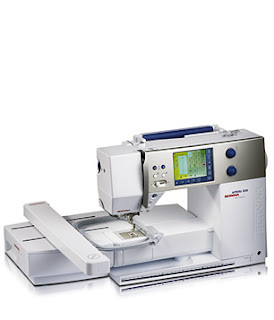 This was one of the first things we learned in our Bernina new owner classes! The store owner told us she couldn’t believe how many emails that came at 3:00 in the morning - “My machine is broken”! I’m so glad I didn’t embarrass myself - whew! So here is another finished Christmas Cottage Block. I see so many of you have nearly finished - working full-time doesn’t afford me much weekday time, however I’m sure I’ll be finished way before the Oct 31st deadline. Don’t forget to leave me a comment to win the Clover needle threader! I’ll consider any comments left from yesterday’s post to all the way through Friday for the drawing! Oh wow, if only all our machine problems were that simple! What I hate about that is all the time you spend trying to work it out. Well anyway, darling blocks! Hi Candace, I am in the cottage block exchange. I am now just getting around to visiting the blogs of the ladies that are in my group. I love your blocks especially the one that says Merry Christmas on the roof. Glad you figured out what was wrong with your machine.